So here we are…6 weeks after sweet little Tanner was born. I started this blog to talk about my love-hate relationship with running and my struggle of staying active while being pregnant, having a toddler and a full-time job. I waited so long to post again because I really had not gotten back into any steady fitness routine. I did not think it was fair to update you on how adorable and obsessed I am with Tanner or how awesome it has been to see Reagan take her first steps and become the cutest little thing in her very first pair of walking shoes. Right before I had Tanner I started reading a book ((which by the way I may never pick up again–who has the time?!?!!)) I only read the first few pages, and in there I read something very important… it went something like this– “anyone can work out while they are pregnant. It is awesome that women do that and it may seem challenging at times, but the real challenge is working out after pregnancy” ((That is a very, very rough summary of what the book said so apologies to the authors)) Once I read that part of the book I realized my challenge was ahead of me. I must say I was very lucky to begin working out very quickly after my C-section. I was home from the hospital two days after Tanner was born and by that weekend I was already taking Reagan for short walks around the neighborhood in the stroller. At my 2 week appointment my Doctor completely cleared to me resume normal life again– his exact words were “Go for a run if you want”. I did not go out for a run that day, but I did go to spinning class that night! The first few times I headed out with Reagan for our walks I was scared to actually run again. I am not really sure what I was fearing but I decided to bite the bullet and ease back into it. After a few laps around the neighborhood of walking/jogging/walking ect I decided it was time to just do it already and run– Just as I knew it would, it felt great! Fast forward to now being almost 6 weeks postpartum and it was time for my first 5k! 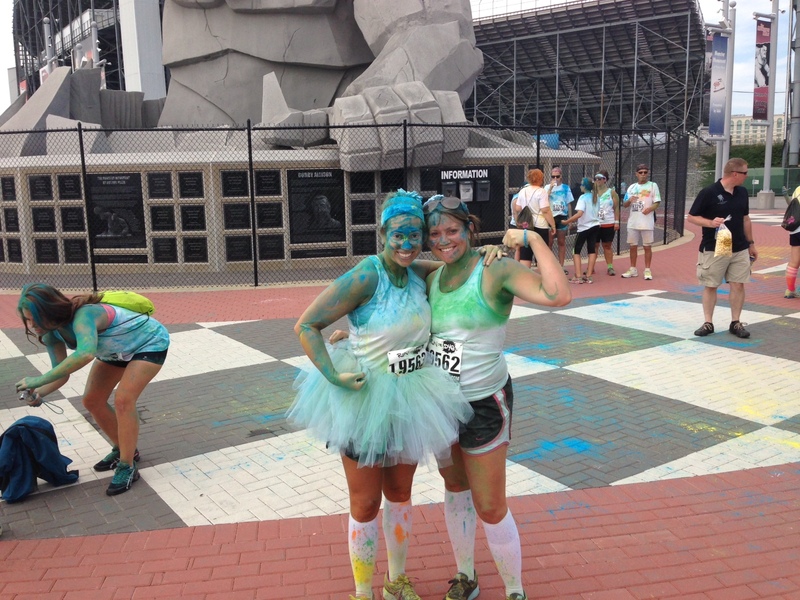 Crazy I know– long before having Tanner myself and a group of others signed up for the Run or Dye race in Dover. We had a blast! The best part about this race is that it was not timed! It was fun to run, not worry about how long it took me to finish and get some crazy colored dust thrown at me! We all had such a great time! I highly recommend getting a big group of people and doing a fun 5k like this! So now back to the struggle to stay active and get fit– the past 5 weeks have been awesome because my husband has been home with me. We can take turns watching the kids and both of us had time to go to the gym, jump on the treadmill or do what ever— but now it is that time of year that he must return to school. I am fortunate enough to have 6 more weeks off to spend with my little love bugs. I am on day #4 of stay at home mom life and I am loving it. The only bad part is that finding time for any kind of fitness has taken a back seat. 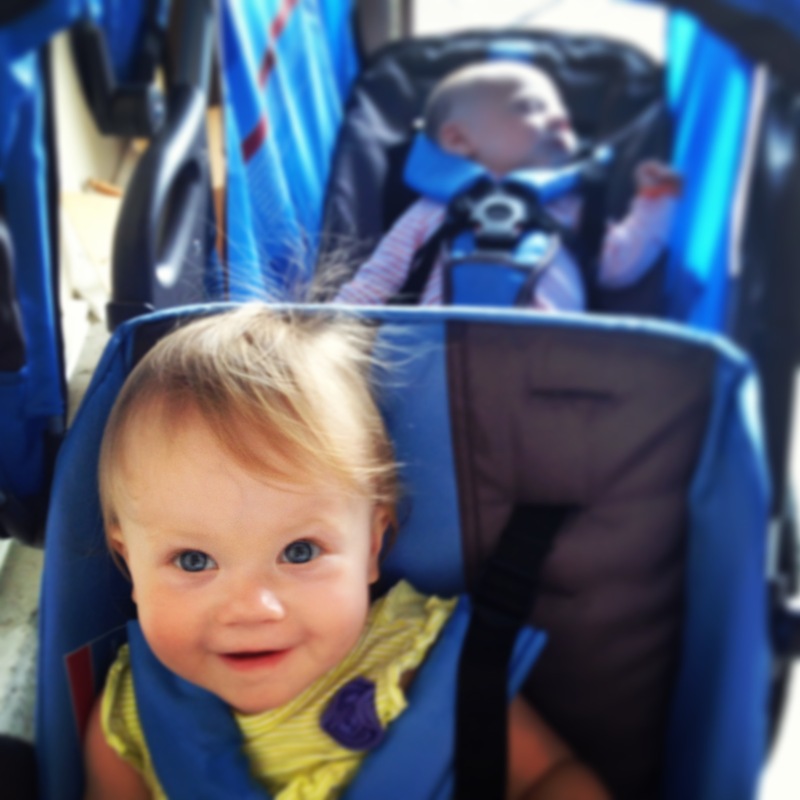 What I have found in my 4 days of being at home is that I love my double stroller. I figure at this point a 2 mile walk is better than nothing at all so I have been loading the kids up and strolling around the neighborhood. Since I have Tanner reclined in the back I have not run with it- simply walked. Us girls have a blast while Tanner usually prefers to sleep. It feels good to be back and I am excited to see where my fitness journey takes me. Next Post What is your running story?